Publish date: 26. July 2018. Spending time in nature, particulary in areas with low vegetation, carries a risk of a possible contact with ticks. Ticks need favourable temperature and humidity to be active, which is why their seasonal activity is pronounced. They are most numerous in the spring and early summer, and can also be found in the early fall, depending on climatic environmental conditions. In Croatia, ticks are most widely distributed in the continental part; the most frequent type of tick found on humans is Ixodes ricinus, which transmits Borrelia burgdorferi, bacteria that causes Lyme disease (Borreliosis), tick-borne encephalitis (TBE) virus etc., while on the Croatian coast, the brown dog tick (Rhipicephalus sanguineus) which transmits rickettsiae that causes Mediterranean spotted fever is riskier for humans. The most frequently reported tickborne diseases in Croatia are Lyme borreliosis and tick-borne encephalitis, and, less frequently, tularemia, Mediterranean spotted fever, anaplasmosis, babesiosis and ehrlichiosis in endemic areas. Ticks live on leaves and branches of shrubs, low vegetation up to one meter in height, in thickets, and mostly in forest undergrowth. They are most commonly infected when feeding on forest animals and rodents, and they can also bite and infect humans if they come across them in their natural habitat. People who engage in frequent occupational or recreational outdoor activites in tick infested areas, such as foresters, soldiers, hikers, hunters, tourists and others, are at a risk of tick exposure. Wear appropriate clothing and footwear (long sleeves, trousers tucked in socks, closed shoes). Avoid dark-coloured clothing and fabrics such as wool and flannel because they are easier to attach to. Avoid walking through shrubs, lying on the ground, and leaving clothes on bushes and on the ground. Use repellents on exposed skin and clothes (use them according to the manufacturer’s instructions – check the instructions on the product!). After returning home, remove your clothes and carefully examine your entire body (with the aid of a mirror or another person). 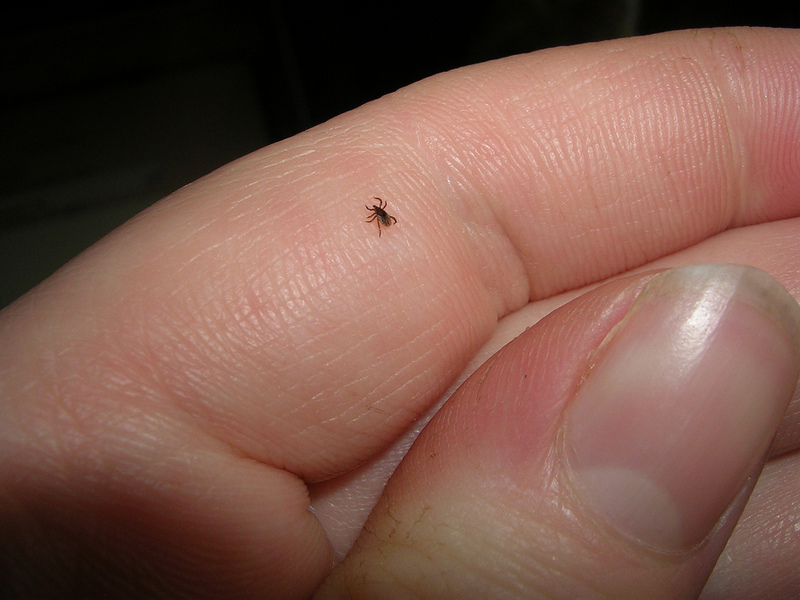 After finding a host, a tick usually remains on the body for several hours before it bites. Check your body and clothes for ticks to remove them as soon as possible, paying particular attention to body parts with delicate skin (in and behind the ears, nape, neck, groins, breasts, arm pits, the area behind the knees, navel…). Children are often bitten on the head/scalp, because they are small and play in grass, where ticks can be found. Take a shower when your return home. If you found a tick on your skin, it is important to remove it as soon as possible – the risk of infection is greater the longer a tick is attached. It can be more easily removed withing the first few hours after being bitten. Wash your hands, cleanse tweezers with antiseptic and pull the tick immediately out (by yourself or by your household member), gripping it by the head as closely to the skin as possible, and pulling it steadily out of the skin. Cleanse the affected skin area with an antiseptic. Do not apply alcohol, cream, oil, nail polish, petroleum, etc., nor burn the tick off. Do not pull it abruptly, squeeze nor crush it, as it would cause the tick to release more saliva or stomach contents and, if infected, more infectious agents in the human body. There is no need to see a physician immediately, unless you develop a rash (a circular or oval reddish-brown rash that clears in the middle, erythema migrans) and/or get fever and chills four weeks (most often seven days) after a tick bite. The rash and/or temperature and chills are most likely due to bacterial infection (borrelia burgdorferi) that is successfully treated with antibiotics. Vaccination can prevent tick-borne encephalitis (TBE). Three injections of TBE vaccine protect you for three to four years. After three years, re-vaccination with one dose is needed to maintain adequate level of protection. Vaccination against TBE is recommended to persons from risk groups who are more frequently exposed to risk of tick bites, only in known TBE endemic areas. It is justified to vaccinate foresters, soldiers, hunters, hikers and tourists who occasionally spend time in endemic areas. Contact an epidemiologist from a regional public health institute or the Croatian Institute of Public Health for information concerning vaccination.